This site is a working farm that has a long fetch to southeast of over 20 miles. Funding restraints and positive results of VIMS' study of the Hog Island Headland and Summerille sites led to the installation of a 1,700 ft headland control system in 1995. Three widely spaced headland breakwaters were constructed and one large spur/breakwater upriver was used to set the embayment. 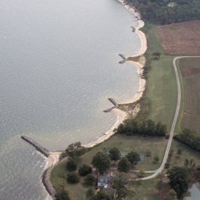 The headland control method consists of breakwaters that are placed close to shore to insure long-term connection and the adjacent upland banks are allowed to erode to equilibrium. The project was designed utilizing shore morphology evolution.